Songs of Eretz Poetry Review is pleased to present "War on Dandelions" by Carol Hamilton, Poet of the Month. Ms. Hamilton will also be serving as the guest judge for the Songs of Eretz Poetry Award Contest which will run from September 1 to October 15, 2015. A detailed biography of Ms. Hamilton may be found here: http://eretzsongs.blogspot.com/2015/08/songs-of-eretz-poetry-review-poet-of.html. The contest guidelines may be previewed here: http://eretzsongs.blogspot.com/p/songs-of-eretz.html. spraying strong vinegar on the roots. and I remember long ago. Still, the outcome is uncertain. and ride away with dignity intact. Poet's Notes: This poem reflects the joyous daily battle I wage with the forces of evil in my yard! Sometimes I think many weeds have perverse wills and wily ways working overtime to outdo me. Someone once suggested to me that a lawn of blooming dandelions can be beautiful, and I do like to live in the world as naturally as I am able. But every few years I decide perhaps I can win a few battles in hand-to-hand combat towards a more orderly landscape. Of course, the battle is a conceit, and the mention of Robert E. Lee at the end of the poem indicates my resignation. And yet, somehow, the old will to win keeps returning. Editor's Note: I enjoy the way the poet weaves rhyme and assonance into the free verse here as with shower & hours, and aches, spray, maybe, away, faces, sprayings, pates, parades, gracious, & away. I also share the poet's mixed feelings about dandelions in the lawn. 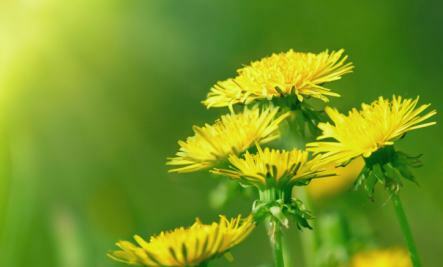 "War on Dandelions" was originally published in The Grey Sparrow.